Leamington, playing with a slight breeze, were on the attack from the outset and won an early penalty which Tom Jewitt drilled into the corner. Skipper Craig Smith took possession at the lineout and set Gareth Shuttleworth off on a direct run at the home try line. Shortly after and from a near-identical play, prop Dan Barber took on the hosts’ defence, only to be held up just short of the line. 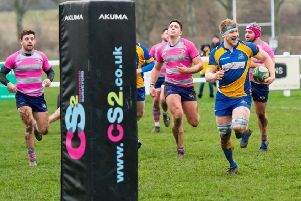 When Rugby St Andrews finally managed to break out, they showed that their backline had plenty of pace to carve a hole in Leamington’s defence and it needed full-back Sam Nunn to halt the impending danger with a superb head-on tackle. Leamington broke the deadlock around the 15-minute mark with a well-worked converted score. They won lineout possession following some quick thinking from Ali Weedon who managed to retrieve the ball and set it up for his back division. Spreading the ball wide, Jewitt took possession and gifted the sweetest of passes to Rich McKowen who swallow-dived over between the posts. Jewitt slotted over the conversion. Almost from the restart, the hosts got themselves on the scoresheet with a penalty goal. However, Leamington were looking comfortable, obtaining plenty of possession from their forwards’ hard work. More scoring chances fell their way and a run from scrum-half Patrick Northover, which opened up a huge gap in the home defence, should have delivered more. Leamington’s first-half momentum changed in an instant when they conceded a yellow card for an innocuous obstruction offence, conceding two tries in the ten-minute spell that followed. As the half drew to a close, Leamington showed resilience with some clinical attacking play. Winger Danny Ruyssesvelt produced a direct run at the home defence and the ball was moved out to the left where Nunn was on hand to crash over to bring it back to 15-12 at the interval. Despite having the wind advantage, the hosts soon found themselves having to defend again as Leamington began the second period on the front foot. An early surge by the pack enabled John Brear to test the home defence with another strong run. Then, as the ball was moved inside, Barber almost forced his way over by the posts. The visitors then won a penalty deep in the home 22 which they chose to run, only to have their attack held up short of the try line once again. This early endeavour proved barren for Leamington and, as the half progressed, the home side began to kick themselves into good field positions to alleviate the pressure. They increased their lead with a further penalty goal and kept Leamington penned in their own 22 for the bulk of the final ten minutes. The visitors, however, did have one final attempt to claim victory when their pack set up their back line with clean possession. However, to Leamington’s frustration, the referee halted proceedings and awarded them a scrum rather than allowing them to play the advantage, stymying their charge.